With voter packages being sent out starting last week, it is the perfect time to discuss the provincial referendum. From now until November 30, British Columbians will have their say in how to elect candidates and parties. The referendum is designed to have two different questions that people will answer via a mail-in survey. Your voting package should turn up between October 22 and November 2. The first question that will be asked is if we should keep our current first-past-the-post (FPTP) system or move to a system of proportional representation in British Columbia. Whether or not you support FPTP, the second question will ask what your preference is between the three proposed proportional representative voting systems. The three proposed voting systems are Dual Member Proportional (DMP), Mixed Member Proportional (MMP), and Rural-Urban Proportional. Of these three, MMP tends to be the system that people who want to keep FPTP lean towards if they have to switch. DMP is a new system designed specifically for British Columbia’s situation—one aspect that was kept in mind when making it is the province’s large geographic region. Judy Darcy, the Minister of Health and Addictions and New Westminster’s Member of the Legislative Assembly, said in an interview with the Other Press that she feels switching to a proportional representation system will make it more worthwhile for people to vote in provincial elections. Darcy was referring to strategic voting—a voting strategy where a person votes to prevent a candidate they don’t support from being elected, rather than voting for the party or person that they prefer. In other words, it’s a preventative measure to attempt to keep a party they dislike out of office by voting for the party most likely to win against the disliked party. FPTP is our current voting system that falls under the winner-take-all category. In BC, this has led to governments being elected as majorities with merely 40 percent of the vote. According to FairVote’s website, out of the 195 countries in the world, 89 of them use some form of proportional representation. Canada, the US, and the UK all use a “winner-take-all” system. Countries such as Norway, Sweden, Spain, Peru, and Angola all use some form of proportional representation. Although this BC referendum does not impact the federal vote, it still may change how the province elects its leaders. Darcy also said that getting away from FPTP might enable politics to become more cooperative, since there are likely going to be fewer majority-run governments in the province. She also said that what she likes about proportional representation is that having to compromise makes for more voices being heard throughout the province. 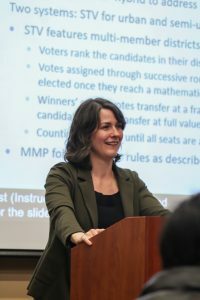 On October 23, Douglas College hosted an event in the Aboriginal Gathering Place at New West campus to break down the differences between proportional representation and FPTP. SFU professor Eline de Rooij was the guest speaker at the event. She explained the history of voting in BC and dispelled some of the myths surrounding the voting systems being called to question. On the following day, Douglas College also hosted a debate between supporters of proportional representation and FPTP. De Rooij said during the talk that she doesn’t believe there is a perfect system out there that will make everyone happy. She then broke down the differences between the three proposed voting systems in conjunction with FPTP. In addition, she stated why the referendum is important and the kinds of things that it will decide. De Rooij explained that there are pros and cons to each of the voting systems, and that there will likely be more parties represented in the legislative assembly. She also said that there is no guarantee that voter turnout, diversity in office, or cooperation will improve after the referendum. A drawback to proportional representation may be that governments might hold less accountability. She also highlighted that policies might not be as quick to change, but that change might be more permanent than it is under FPTP. De Rooij warned during her presentation to be wary of the myths put forward by those for and against proportional representation. As an example, she discussed the notion that FPTP is less likely to elect fringe and/or extremist parties. Darcy also addressed this notion and said that people can use recent elections in Canada and the US to show that FPTP does not prevent fringe governments from being elected. One thing that both de Rooij and Minister Darcy both emphasized is that if people vote yes for proportional representation, in two terms’ time there would be another referendum that would allow British Columbians to go back to FPTP or keep the new system. For more information about the systems, visit elections.bc.ca to get non-partisan information about the proposed systems, or check out the information provided in the voter’s package.